At CHtech we strive to assist people in reducing the power consumption by accurate measurement and intelligent changes thereafter. This is the case study of my own home to show the savings that can be achieved by knowing your power. There are many benefits to saving electricity, the most obvious being money. More important though is the impact on the environment. The above bills show a monetary change from R1701.42 to R465.38 (note there was a substantial increase in tariffs in this time). That’s a saving of R1236.05 per month. Bellow I have described how this was achieved hopefully to encourage others to do the same. Remember, you are going to spend the money, either giving it to Eskom on an escalating rate or investing in technology which will pay for it’s self in less than 3 years and thereafter the savings are yours. The choice in technology is critical. In March 2010, I realized that I could not sustain my household power costs. We were using 1500+ units a month and with the Eskom increases set to double the costs, something had to change. I have budgeted R30000 with the aim of saving R1000 per month. If I achieve this I will recover my investment in 30 months. From the proposed tariffs for July 2010, it’s not difficult to see that the 450-1500kw bracket is the most expensive to be in. Also note if you go above 1500 units, you get charged a R225 service fee! It would be ideal to get down to bellow 450kw per month but is it possible? This is my power saving blog to share my findings with those that are interested. This was the only tool I had but the only way I could measure power consumption. There was no way to establish any trends of patterns but it was a start. 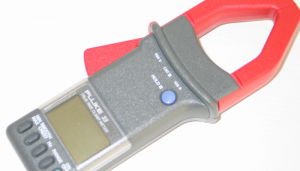 Also it could only measure current with no Power factor or voltage. It was clear even from my rudimentary measurements that the geyser was a major factor. 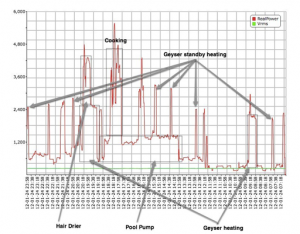 It was clear that hot water heating occurred in the morning and evening. Solar hot water heating did not fit the profile so I decided to by a heat pump. I also wanted a system that would compliment photovoltaic at a later stage. 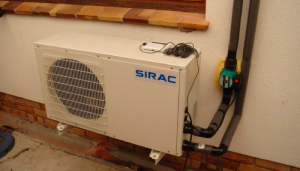 After some shipping delays, my Sirac heat pump arrived.The pump was installed and the heaterelement decommissioned. I realised that I had not installed the heat pump temperature sensor optimally. The manufacturer allows for the sensor to be moved into the geyser pocket. This means the circulation pump does not need to turn on to sample the waster and there is less loss of heat from running water through the pipes every 10 minutes. The mod was done today. It is estimated this change improves efficiency by 25%.